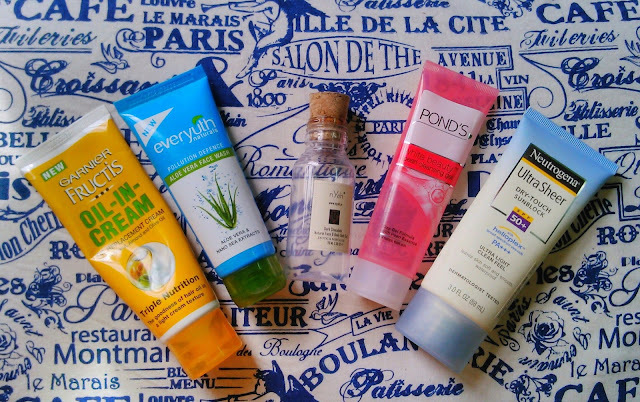 Today am writing my first skincare and haircare empties post. I have seen a lot of bloggers writing this post so I thought of giving it a try. I had a tough time emptying these all products since I keep them in the cupboard and eventually forget to use them. So this time I stocked them up in my bathroom storage to I use them. Basically these types of posts give an idea to you as well as people who read this post, whether particular products are worth trying or not. Before I begin let me tell the Netrougena Sunscreen in the below pic was used and emptied by my husband. I told him one day to get rid of his tan and use sunscreen and he bought this. All other products were used by me. Another point, Za true white exfoliating clay and Everyuth 3-in-1 Neem face pack both were dumped before taking the pic. So they are missing :D in the pic. I cannot stop raving about this shower gel. It is so amazing that I didn't use it for few months with the thought of emptying it. I received it in my first edition of #sugarbox and I went on to buy second bottle. It is still available at shop.sugarbox.in. The shower gel is intensely moisturising and a thorough cleanser. It foams quite well and has an aahmazing chocolate aroma. As I had stated earlier you will be tempted to eat it. It is quite affordable as compared to other shower gels plus it has added benefits of no chemicals. Verdict- Worth trying and quite affordable. Use it to fall in love with it <3. You will never regret buying it. Verdict - Affordable and worth trying!! I bought this product just because of the cute pink packaging. It is gel in every sense as the texture is very soft and it cleanses well. But I didn't find any whitening effects as claimed by the brand. It makes the skin feel fresh and clean after use. Using it more than once a day may dry out the skin even for oily skinned girls. Verdict - If you want a luxury facewash it is this. You may skip buying this. I was on my second tube of this oil in cream, revolutionary.... blah blah cream. It is ok to use this product occasionally. I used it on some back to back occasions and my hair have become more dry than befor and have led to hairfall. It is better to oil the hair than put a lot of chemicals. Am skipping this product, rather some was left in the tube before dumping. It is a nice facepack and does a decent job of removing oil as well as giving a little glow to the face. The only pain is chemicals and loads of them are present in this facepack. It is a great budget friendly product. Verdict - Has a lot of chemicals and is budget friendly. My husband used this and I didn't find any difference in his tanning even after using for 3 months. I don't know whether it works or not. But since I don't use sunscreen at all so it doesn't matter whether it works or not. Verdict - If you use sunscreens you may try this. I used it regularly and it reduced acne a little bit but is very drying for the skin. Plus it has many chemicals so am surely not buying this again. Verdict - Don't buy as it has many chemicals and is very drying for skin. So this was my empties list what did you empty till now? !